Dedicated to sign makers and digital printers in Ireland. 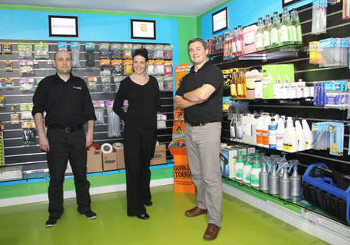 Sign+Digital Customer Service Team Tony Sheena and Morgan Sign+Digital, a Dublin based supplier of sign materials and Roland wide format digital printing equipment, have just opened a new purpose built sign tool shop. Located within their Creative Centre in Airton Close in Tallaght, the new tool shop was officially opened on Monday the 3rd of September and is the only tool shop dedicated to sign makers and digital printers in Ireland. 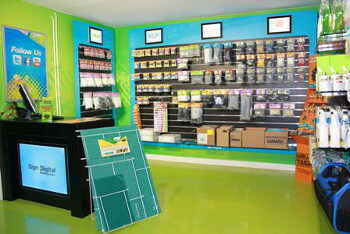 The tool shop offers a large range of tools, sign accessories and fixtures & fittings to suit every sign job. The new shop is not just for sign makers. There is also a wide variety of equipment for digital printers including grommetting machines, digital heat presses and a very popular cap press from Stahls. As an Authorised Dealer for Roland, visitors to the Sign+Digital Tool Shop also have the opportunity to view a demonstration on their full range of Roland wide format digital printing equipment. The Sign+Digital Tool Shop is open to the trade Monday to Friday, 8.30am - 5pm each day. To view more information click here.